The term Bluetooth is derived from tenth-century Danish monarch Harald Blåtand, evidentially the wireless networking champ of his time. Blåtand was considered a peacemaker in warring Scandinavia, and isn’t networking after all about bringing people — or things — together? In any case, Blåtand apparently translates to Bluetooth in English. Bluetooth (the technology, not the Viking king) is a short-range wireless scheme that lets your Mac make nice with a gaggle of compatible gadgets, from up to 30 feet away. Connect the Mac to a Bluetooth cell phone at a distance of 30 feet. If you don’t have access to a Wi-Fi hotspot, you may be able to use the phone as a modem to connect wirelessly to cyberspace. Wirelessly print through a Bluetooth printer. Exchange files with another Bluetooth-ready Mac or other computer or gadget. Schmooze via iChat through a Bluetooth headphone. Synchronize data with a Palm-based handheld device. Control a wireless Bluetooth keyboard or mouse. Some newer Macs come equipped with Bluetooth capabilities. Companies such as Belkin and D-Link sell Bluetooth adapters. The path to a meaningful Bluetooth experience starts in System Preferences. Click Bluetooth under the Hardware section, and you’re taken to the area shown in Figure 1. Figure 1: Controlling everything through Bluetooth Preferences. Before the Mac can communicate with a Bluetooth device, or in turn that device with your Mac, the machine’s Bluetooth feature must be powered on. To help other devices find your Mac, select the Discoverable option. Similarly, you’ll want your other Bluetooth devices to be placed in a Discoverable mode so that your Mac can communicate with them. But be wary. If you’re out in public, you may want to turn off Discoverable mode for security or privacy reasons. You can control how the various devices share files with your Mac. Click the Sharing tab in Bluetooth Preferences and turn Bluetooth File Transfer On or Off as desired. Inside this important area, you can also choose to permit Bluetooth File Transfer, Bluetooth File Exchange, and Bluetooth-PDA-Sync. You can also determine the Public or other folders that Bluetooth devices are permitted to browse on your computer. As one other key measure of security, select the Require Pairing for Security option (described next), which means that a password will be required before files can be transferred. 1. Choose Bluetooth in System Preferences. 2. Select the Devices tab and click Set Up New Device. 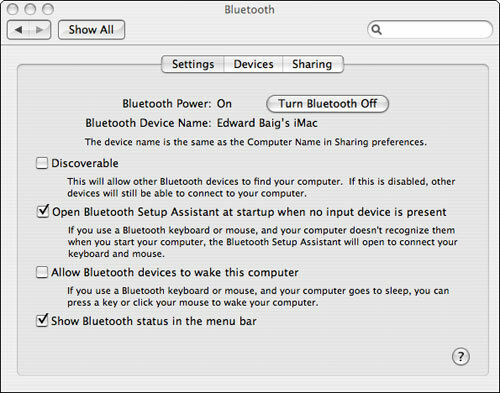 Alternatively, if the Bluetooth status icon appears in Tiger’s menu bar, click the icon and click Set Up Bluetooth Device. Either way, the Bluetooth Setup Assistant appears. 3. Select the types of devices you want to set up, such as a mobile phone. Choose Any Device if the device you have in mind is not on the list. Make sure that the given device is within 30 feet of the computer. 4. Make sure that Bluetooth is turned on in the selected device. If Bluetooth is not turned on, you may have to dig through the device’s menus to find the control that wakes up Bluetooth. The Mac will spend a few seconds gathering whatever intelligence it can about the chosen device to determine how to interact with it. The device will ask you to enter a passkey. The pairing process is complete, and the gizmo and the Mac can share a Bluetooth connection. You may want to take a few more steps and click Devices under Bluetooth Preferences. From there, highlight the device in question and then click the Configure button to set up any other supported Bluetooth services on the device. To send files wirelessly from the Mac to the device in the future, click the Bluetooth menu icon and choose Send File. Then, select the file you have in mind from the Finder window. Click Send. Remember to turn on Bluetooth in the other device.